John Hamer on the left is a Seventy. Lachlan MacKay (right) is as an apostle. Both are members of the Community of Christ. I’m excited to start 2018 two amazing guests: a Seventy and an Apostle of the Community of Christ: John Hamer and Lachlan MacKay. I’ll let them introduce themselves. Lachlan: Sure, [I’m] Lachlan MacKay, a member of the Council of Twelve in the Community of Christ. I oversee the northeast field in the U.S. which is Michigan and basically Kirtland to Maine to Virginia. I have functional assignments including Community of Christ Historic Sites. I oversee historic sites and lead the church history and sacred story team. John: In terms of the history work that I do, I primarily have studied the broader Latter-day Saint tradition churches. Like I say that would be all manner of –ites, so the Strangites, especially but also Cutlerites and Hedrickites and everybody else, Josephites, our tradition. I’m a member of Community of Christ. I serve as the pastor of the downtown Toronto congregation. I’ve been called to be a Seventy. I’m a Seventy-designate. The ordination will happen in October. I am also a past president of the John Whitmer Historical Association (JWHA), which is essentially the other –ites, or the Community of Christ’s version of the Mormon History Association (MHA), those kind of things. We’ll be talking a little bit about LDS myths. GT: One of my favorite blog posts was, it’s been a decade now, the Top Myths about the Community of Christ for Mormons. John: Oh yeah, the Top 10 myths, I don’t remember exactly how it was, the top 10 Mormon myths about the Community of Christ or something like that. That one we ended up doing a couple of podcasts with that. I think we did one on Mormon Expression that was on that same topic. One of the ones for the LDS Tradition, one of the blogs posts that gets the most traction is for whatever reason, sometime in your curriculum every spring you do the Milk & Strippings story. Then suddenly this essay that I’ve written that has been read more times is on the Milk & Strippings story because every May or something like that it comes up for some reason. I don’t know why. Lachlan: So Kirtland in the 1830s, it’s a house for public worship with a strong emphasis on empowerment, both spiritually and intellectually. Two-thirds of Kirtland Temple was classroom space. You would worship in the temple on Sundays, and you would go to school six days a week. Kirtland High School met on the third floor. Students ranged in age from six through adults, so it was the center of their community life. We’ll also talk about baptism for the dead as well as vision of Elijah in 1836 in the Kirtland Temple. Did you know that there were baptisms for the dead in both Kirtland and Wisconsin in the early days of the church? What do you think of some of these differences in temple worship practices between the two churches? John has been a big presence in the bloggernacle. Were you aware that he had been ordained a Seventy? Because so many churches founded by Joseph Smith have similar names, sometimes it is easier to name the groups by their next founder. For example, the Strangites have a similar name as the mainline LDS Church. Their church is officially known with slightly different capitalization and punctuation as the Church of Jesus Christ of Latter Day Saints (vs. Latter-day Saints), and were founded by James Strang following an angelic visit. We will talk more about them in a future episode. Cutlerites were founded by Alpheus Cutler and are officially known as the Church of Jesus Christ. Hedrickites were founded by Granville Hedrick and officially known as the Church of Christ or Church of Christ (Temple Lot.) They are sometimes referred to as the Temple Lot Church. We will discuss them in a future episode. Josephites are better known as Community of Christ or RLDS Church. The official name is the Reorganized Church of Jesus Christ of Latter Day Saints. They are called Josephites after Joseph Smith III. The Utah church is sometimes referred to as Brighamites, after Brigham Young. John was ordained in October 2017. Previous Previous post: I want to Rock and Roll all night…. Interesting discussion and interesting history and information. I think the LDS tradition has gone all in on the idea of saving ordinances and covenants being the key to salvation, where the Community of Christ is more focused on a mainline Christian idea of the doctrine of Christ being a key to personal and community redemption. The LDS focus puts the institution front and center in its role in salvation, where that is not as true in the Community of Christ and other mainline protestant traditions. The result is that the LDS tradition has much more institutional loyalty and strength and hubris. It’s interesting that the Denver Snuffer movement has taken “super Mormons” and totally changed their focus from saving ordinances and covenants to a focus on the doctrine of Christ and away from the institution. There is enough Church history and scriptural evidence to make a strong argument for this position. It seems like the LDS Church has really doubled down on this idea of temples and covenants the last 10 years. When I was growing up, Church growth was always pointed to as the evidence that this was God’s work. As that has slowed, it’s been interesting to see the focus shift to temple building/number of temples as the evidence that this is God’s work. “When I was a missionary, the Church had 5 temples, now we have 157 . . .” I hope that as LDS people, we can let go of some of our hubris, better understand Church history and continue to build bridges and build on common goals with our friends at the Community of Christ. The ordinance of the washing of feet began in the Kirtland Temple; and RLDS history states “January 21, 1836, leading officers of the church anointed and blessed in Temple and received spiritual endowment.” I suppose this continues in the LDS Initiatory but I’m curious about the CofChrist POV. What are Hamer/MacKay’s opinions on the RLDS attempt to sell Kirtland Temple in the late 19th century? Would they consider it now to the LDS? Very good podcast interview with these 2 topnotch guys. I was especially interested in how Lach put the vision of Christ & Elijah in Kirtland temple in context. It took place on Easter Sunday, a week after the official dedication, which was on Palm Sunday (the Alleluia! shout was certainly appropriate). John’s chart on temple development is an excellent visual explaining the differences between the 2 churches’ different approaches to temples. And on a side note: I’m guessing no LDS seventies have a haircut like John’s. Oops. Meant to refer to the Hosanna shout instead of Alleluia, as per the refrain of “The Spirit of God Like. a Fire Is Burning” and, I believe, part of current LDS temple dedications. My next podcast (to be released this week) discusses the disputed ownership of the Kirtland Temple in the 19th century, so I hope you check that out later this week. As for selling the Kirtland Temple to the LDS Church, I remember a quote from John on a podcast that said “Not only No, but Hell No!” On the other hand, I think selling the Printer’s Manuscript to the LDS Church was unthinkable. If CoC/RLDS finances continue to deteriorate, I suppose selling the Kirtland Temple could be a possibility, but I don’t think they would consider selling the Kirtland Temple in the near future. Restoration Trail Foundation, the RLDS group that maintains their historic sites, was cut from the Church’s budget in the 1990’s and had to rely solely on donations. Is that still the case? I don’t understand Hamer’s attitude concerning ownership, unless it’s a “this is ours, not yours” similar to the JST manuscript. I’ve heard the CofChrist now charges admission to tour the Kirtland Temple (not so for the one in Independence). There’s no doubt that Kirtland Temple would be well maintained by the LDS. Very little chance of it being “converted” to accommodate ordinances for the dead since it’s part of the National Register of Historic Places. At Kirtland there’s a $5 per person charge earmarked for preservation. Not sure about the identical smiles? It was quite informative, Rick. 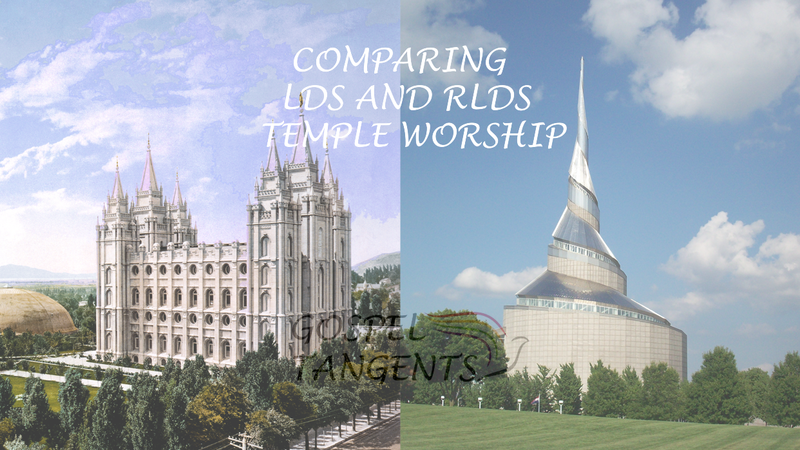 I would appreciate you checking out the W&T post “Temple Ordinances and the RLDS” from Dec. 2, 2015 and giving me an opinion.